Opening a series of activities to welcome the world cultural heritage recognition for the Ho Dynasty, the Thanh Hoa Provincial Museum has put about 500 items relating to the Ho Dynasty Citadel, Ho Quy Ly and the Ho Dynasty on display. On display are photographs, books, literature, newspapers, magazines, scientific analysis and research by both domestic and foreign academics. The documents include four main themes of the Ho Dynasty Citadel, Ho Quy Ly, the Ho Dynasty and the Ho Dynasty Citadel’s recognition by UNESCO as a world cultural heritage last year. Among the collection are documents written in French before 1954. Among the exhibits are photos of the citadel from the air as well as the camp where the stone masons lived during its construction, plus the book La Province De Thanh Hoa by French scholar Le Proton. The exhibition is to allow the public access to the Ho Dynasty Citadel relics and the cultural history of Thanh Hoa Province and to meet demands from researchers. 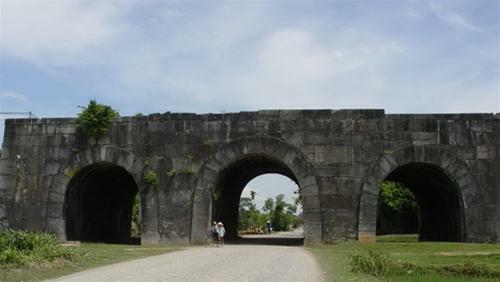 Located in Vinh Tien and Vinh Long Communes in Vinh Loc District, the Ho Dynasty Citadel measures 870 meters by 883 meters and was built in 1397. The citadel’s construction was supervised by the Tran Dynasty’s top mandarin, Ho Quy Ly, who later occupied the citadel when he took the throne by force in 1400 and changed the country’s name from Dai Viet to Dai Ngu. Also known as the Tay Do Citadel, the ancient building is famous for being strategically located where it could be easily defended. The citadel is protected by a mountain range to the north, while the Ma River runs to the west and the Buoi River to the south, creating a huge natural moat. However, now almost all of the citadel’s main structures have been seriously damaged due to the ravages of time, while only the wall and four main entrances are still well preserved. Although the Ho Dynasty only lasted from 1400 to 1407, Emperor Ho left a significant legacy. He is credited for pioneering the circulation of the first banknotes in Vietnam, expanding the network of schools and promoting the use of the Vietnamese Nom ideographic script.